Perfect for any young swimmer looking for a fun and fashionable new look in the pool. This colourful FunAqua girls Nenufar Swimsuit combines exceptional comfort and durability for training or regular swim sessions. The vibrant Nenufar pattern is one of FunAqua's newest designs. Made from a high quality chlorine-resistant fabric that will prevent these colours from fading, this swimsuit will look and feel as good as new for longer. 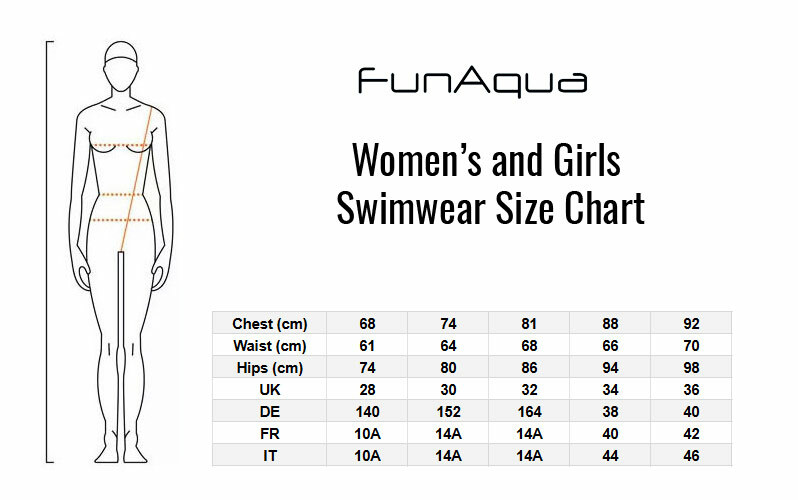 This colourful FunAqua girls Nenufar swimsuit is the perfect choice for any swimmer seeking a fun and fashionable new look for their swimming sessions. Comfortable and extremely durable, this girls swimming costume is a perfect option for swim training or regular pool use and features a fashionable new Nenufar pattern, which is one of FunAqua's newest designs. Made using a high quality polyester fabric, this swimsuit is chlorine-resistant and offers excellent UV protection to retain its bright and vibrant appearance. It will also look and feel like new for longer, even after countless hours in the pool. The two-way stretch fabric ensures the perfect fit time and time again, while a black thin-strap openback design provides exceptional flexibility in the shoulders and arms to help you take on any practice drill. Bright, fun, long-lasting and fast-drying, the FunAqua Nenufar has everything you could possibly wish for from a training swimsuit.